Roe Rovers midfielder Conor Mullan kept up his impressive recent goalscoring run in their stunning 4-1 victory over Burnfoot. Roe Rovers returned to First Division action on Saturday with an impressive 4-1 win over neighbours Burnfoot. The victory means the Roesiders secured second spot on the own and moved three clear of their opponents. 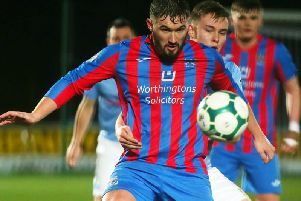 Rovers had not played in six weeks and started the game brightly and could have taken the lead in the first few minutes after a great move down the left side which saw Darell Mulgrew deliver a lovely cross only for Brendan McGonigle to head narrowly wide. The pace of Ciaran Deery, Mulgrew and Jack and Brendan McGonigle was causing Burnfoot all sorts of trouble early doors, this was backed up by a classy midfield trio of Conor Mullan, Loughlain Toland and Matty Hamilton in midfield. Indeed it didn’t take Rovers long to find the lead when Toland set Jack McGonigle clear but his shot was well saved by Burngoot keeper George Elder but the dropping ball was well finished by Brendan McGonigle to put them one up. This sparked Burnfoot into life and the game was much more of an even contest now. Burnfoot were putting pressure on Rovers back line now but Tommy Hasson, Ciaran Carmichael and Chris Doyle held firm backed up by Cain Breslin in goal. Just after the midway point in the half Burnfoot got their reward and equalised from a corner. It came after Carmichael had made a goal saving tackle only for the goal to come from the resulting corner. With Burnfoot being the much taller side they caused Rovers all sorts of trouble at set plays and they just couldn’t get the ball cleared and Stuart Maxwell managed to nod it over the line. With the game now all square and Burnfoot now on top but Rovers rallied and found themselves in the lead just before half-time. It was McGonigle again making it 116 goals for the club, when after a smart pass in the box from Hamilton there was a huge slice of luck as the shot took a big deflection of Burnfoot’s Ross Elder. Despite leading 2-1 at half time the game was in the balance so Rovers knew it was going to be a tough half. The home side pressed brilliantly in the second half and Burnfoot never really got going. The back line of Rovers kept Breslin well protected throughout and with their pace going forward again was causing all sorts of mayhem. Time for goal machine Conor Mullan to get in on the act and what a strike it was, again after good pressing from Rovers, he found himself on the edge of the Burnfoot box before firing a lovely shot into the roof of the net, making it seven games in a row where he has found the net. Rovers then brought Chris Harbinson and Finbar O’Brien on to freshen things up. Burnfoot battled well but they weren’t getting much joy in front of the net, shots were rushed or fired wide. With the game almost over Rovers added a fourth goal through Mullan again. A good run from O’Brien on the right side ended with his low cross fired into the box, which found its way to Mullan at the back post and he took a touch before calmly slotting home. That’s how the game finished with Rovers deserving the victory but as with any derby you have to earn the rights and Rovers certainly did that this time out. Next up for Rovers is Kilrea in the North West Junior Cup which will be a real tough encounter, they’ll go into it with high hopes no matter.